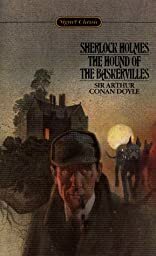 We owe 1902's The Hound of the Baskervilles to Arthur Conan Doyle's good friend Fletcher "Bobbles" Robinson, who took him to visit some scary English moors and prehistoric ruins, and told him marvelous local legends about escaped prisoners and a 17th-century aristocrat who fell afoul of the family dog. Doyle transmogrified the legend: generations ago, a hound of hell tore out the throat of devilish Hugo Baskerville on the moonlit moor. Poor, accursed Baskerville Hall now has another mysterious death: that of Sir Charles Baskerville. Could the culprit somehow be mixed up with secretive servant Barrymore, history-obsessed Dr. Frankland, butterfly-chasing Stapleton, or Selden, the Notting Hill murderer at large? Someone's been signaling with candles from the mansion's windows. Nor can supernatural forces be ruled out. Can Dr. Watson--left alone by Sherlock Holmes to sleuth in fear for much of the novel--save the next Baskerville, Sir Henry, from the hound's fangs?